One of the most exciting parts of designing a custom home is choosing kitchen options. You should put extra thought and care into your kitchen’s design and layout, not only because it’s one of the busiest rooms in your home, but also because the kitchen has such a strong impact on its resale value. Any real estate professional will tell you that an up-to-date, well-equipped kitchen can add thousands of dollars to a home’s sale price. 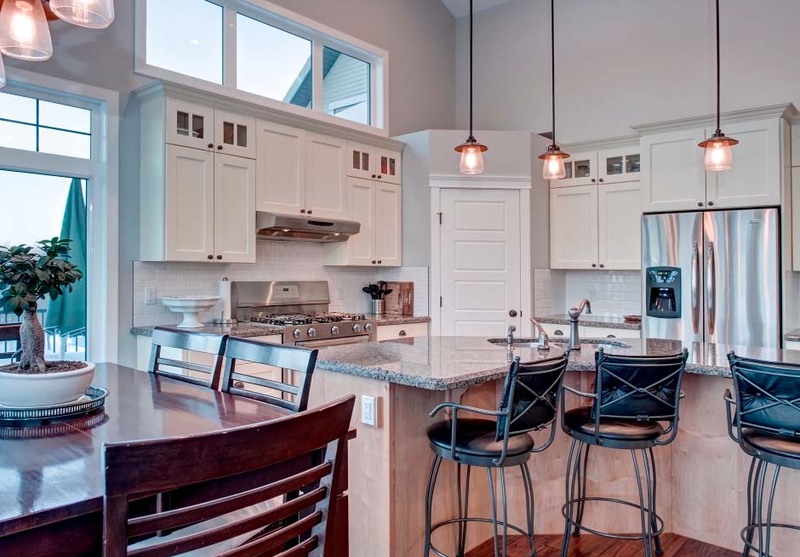 Custom home builders in Calgary can create just about any kitchen you can imagine. With that in mind, let’s look at some of the unique features you may want to incorporate into yours. Prevailing wisdom recommends that you not go overboard when it comes to jumping on bandwagons and trends, as it can date your kitchen and potentially make your home less attractive to would-be buyers if you decide to sell. Bamboo. This eco-friendly material gets top marks for sustainability, and you can use it for a lot more than floors. Butcher blocks, counter and table surfaces, cabinetry and trim can all be crafted from bamboo. Engineered quartz. This is a strong choice for counters, as engineered quarts offers unmatched heat, scratch and stain resistance. It’s also available in a wide range of neutral colours and palettes, making it easy to incorporate into any interior design style. IceStone. This unique combination of recycled glass and concrete is very affordable and available in a dazzling array of translucent colours and tones. It works particularly well for counters. Recycled glass is also becoming a popular base material in kitchen tiles and backsplash arrangements. Concrete. Floor tiles, counters, and walls can all be finished with durable, long-lasting concrete. It’s easy to add texture and patterns to concrete to give it a more polished, nuanced look. Stainless steel and copper sinks and faucets. These materials are ideal if you want to install recycled kitchen plumbing fixtures. They look great, offer outstanding durability, and last for many years without requiring much maintenance. Aerators. Save water by adding an aerator to your kitchen sink. These appliances infuse water streams with small bubbles, producing excellent water pressure while cutting back on volume usage. Electric induction cooktops. These efficient cooktops use the principle of electromagnetic thermal transfer, allowing you to cut your mealtime energy consumption by up to 50 per cent. Water filtration. Spring water may be better than what comes out of your tap, but all that bottling is bad for the environment. What’s the solution? A home water filtration system. These allow you to automatically remove impurities from tap water without adding to plastic or glass consumption. Dinnerware. Recycled glass, bamboo and clay are becoming more commonplace as consumers seek eco-friendly dinnerware alternatives. The professionals at Fine Line Homes customize much more than just kitchens; we allow you complete and total design freedom over every aspect of your new home. It’s part of our unique home creation system, which we’ve carefully refined and optimized over the years to make custom home construction an easy and stress-free process. We’re pleased to offer free, no-obligation estimates for your new custom home, and you’ll find that your dream of custom home ownership is more affordable than you might think. To learn more, or if you have any questions, please contact us.